I WASN’T PLANNING A SPECIAL ARTICLE THIS YEAR FOR THE 4TH OF JULY, UNTIL A COUPLE OF FACEBOOK FRIENDS CONTACTED ME WITH REASONS WHY I SHOULD. THAT’S WHEN I CONTACTED MY OLD FRIEND DON ORIOLO, WHO DRAWS FELIX THE CAT, AND ASKED HIM IF HE HAD ANY CARTOONS LAYING AROUND WITH FELIX CELEBRATING THE 4TH. A FEW HOURS LATER, DON SENT ME THE ABOVE PICTURE THAT HE PAINTED JUST FOR HE OCCASION…THAT’S WHEN I KNEW HOW IMPORTANT THE 4TH OF JULY IS TO MOST AMERICANS. 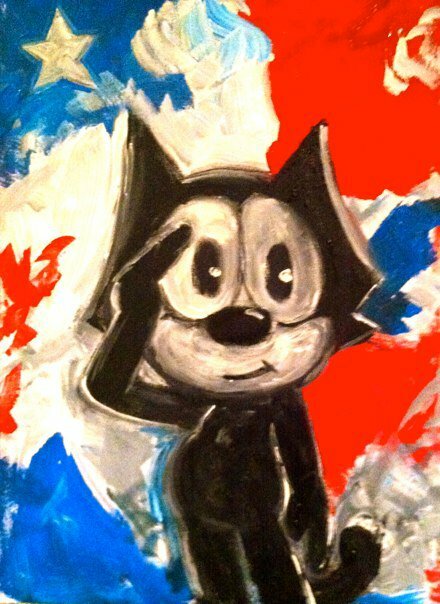 Tags: FELIX THE CAT 4TH OF JULY, PATRIOTIC MUSIC VIDEOS! WHEN I POSTED MY OBITUARY LAST WEEK I REALLY THOUGHT I WAS GOING TO DIE. I SAW DR.LAI FOR THE SECOND TIME THIS AFTERNOON, HE GAVE ME ANOTHER CORTISONE “LITE” SHOT, WHICH AGAIN WORKED MIRACULOUSLY! I GAVE HIM THE PAPER I WROTE ON MY RADICAL DEEP BREATHING EXERCISE WHICH MIGHT’VE SAVED MY LIFE! I TOLD HIM THAT DURING A MEDITATION I WAS TOLD THAT STEM CELLS WOULD HELP ME WALK AGAIN. WHEN I TOLD DR. LAI, HE SMILED AND SAID THAT’S AN OPTION USING STEM CELLS FROM MY OWN BONE MARROW (NOT FROM EMBRYOS), HE ALSO IS ARRANGING A PHYSICAL THERAPIST TO COME TO MY HOUSE TO HELP ME. HE ALSO HOOKED ME UP WITH ANOTHER DOCTOR WHO WILL USE ELECTRIC THERAPY ON ME WHICH HAS WORKED FOR ME IN THE PAST. I TOLD DR. LAI HOW I VISUALIZED MYSELF CLEARING OUT THE LIQUID IN MY LUNGS AFTER OPEN HEART SURGERY IN 1966, AND WALKING 36 HOURS AFTER THE OPERATION MAKING MEDICAL HISTORY. OBVIOUSLY INSPIRED HE SHOWED WITH HIS HANDS HOW MY UPPER SPINE WAS OUT OF ALIGNMENT AND HOW TO VIUALIZE IT BACK INTO SHAPE WHICH I’M STARTING TO PRACTICE. I’LL BE ABLE TO DO MORE WHEN I GET SOME MORE MEDICAL MARIJUANA TOMORROW. AFTER BEING TOLD BY TEN DOCTORS THAT THERE WAS NO HOPE FOR ME, I THANK GOD FOR DOCTOR LAI!